RBC Capital Markets raises its 2019 Brent crude forecast to $75 a barrel and warned of bouts of $80 oil. A shortage of bullish bets on oil compared to recent history leaves crude futures with plenty of room to run, RBC says. Steep OPEC supply cuts, robust demand and geopolitical risk also factor into RBC’s forecast. 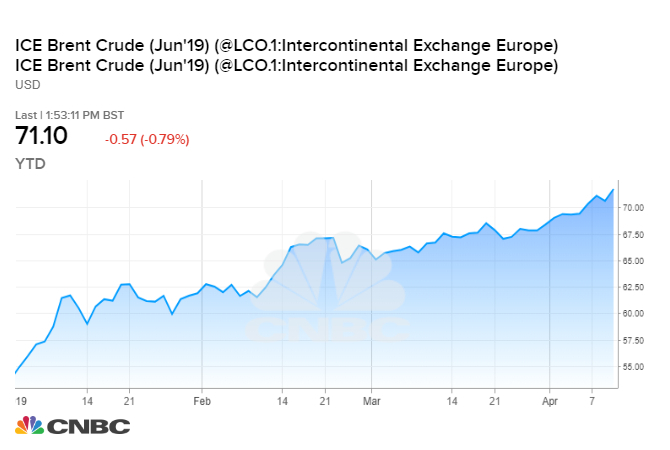 “In short, there is room to run to the upside given that geopolitical hotspots are still a clear and present danger for the market, but many wounded bulls remain following the Q4′18 washout,” the analysts said, referring to the collapse in oil prices at the end of last year. “This is a surefire sign that the market is well balanced,” the RBC analysts said. The global balance of supply and demand would have been looser if not for “the ferocious degree of Chinese buying.” RBC estimates that China has stocked away 310,000 barrels per day since U.S. energy sanctions on Iran started in early November. Howeer, RBC warns that the fate of global oil consumption largely rests with China and India, which together account for nearly 55 percent of demand growth. While fears of a sharp economic slowdown may be overblown, the degree to which demand depends on a few markets remains an underappreciated risk that could push down oil prices.